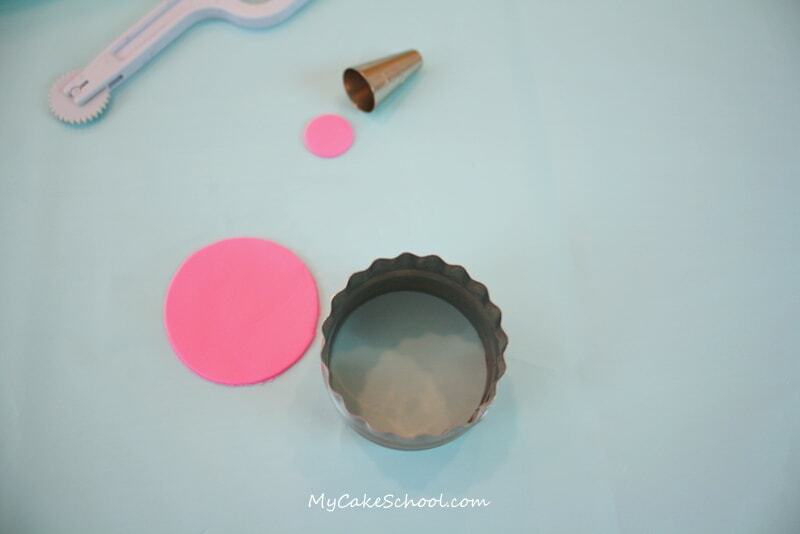 The most difficult part of this cake was creating a template–which really wasn’t difficult at all.– This step will be even easier for you, since I’m giving you my template! Since the template fits a 9×13″ sheet cake, I had to divide it into two parts (for you to tape together later). Here are links to the Top Half and Bottom Half. 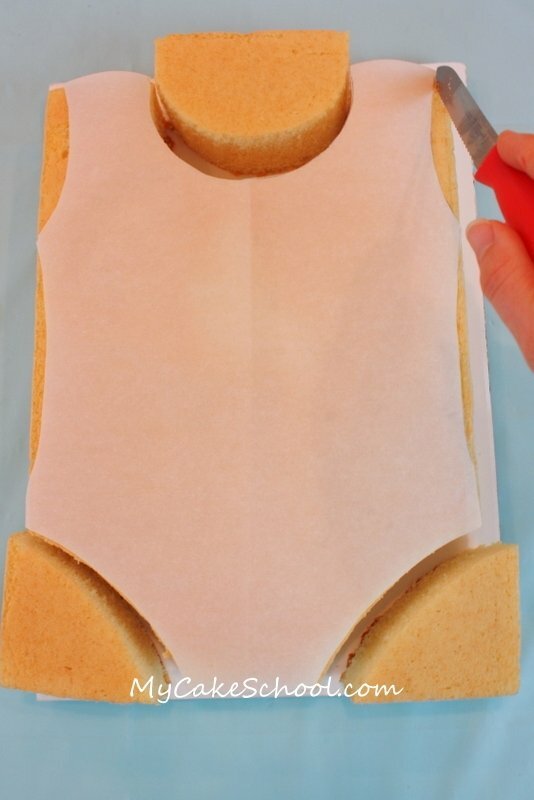 First, I made my swimsuit template by cutting a sheet of parchment paper to the size of the 9×13 cake, which I then folded in half so that I could out my shape. Folding ensures that both sides will be symmetrical. Cutting away the excess…(use a serrated knife!) You may find it easier to do your carving when your cake is partially frozen. I used a fairly dense recipe and so the carving went very quickly. 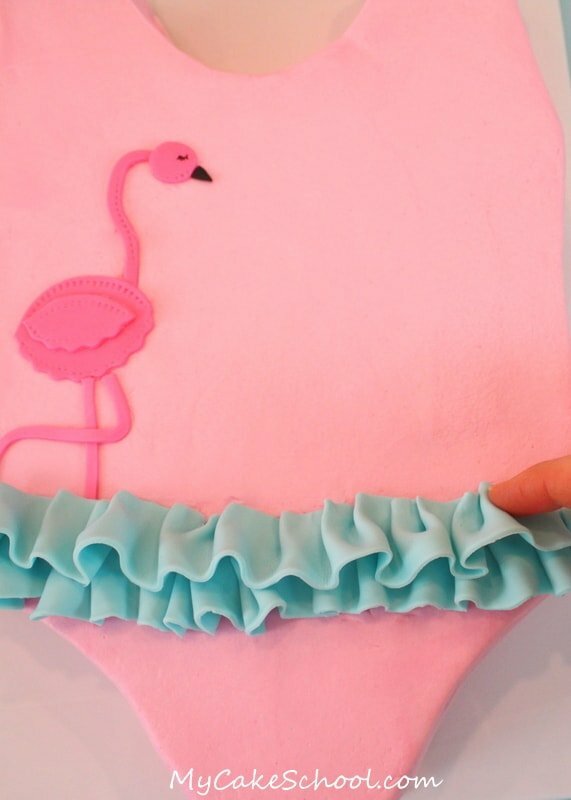 I wanted to have a cute design on the swimsuit…and somehow, today a flamingo seemed like the only way to go ;0) — First, I cut a small circle of pink fondant (tinted with Americolor Deep Pink) for the head using the bottom of a standard piping tip. (I used a tip 12.) I kneaded in a little bit of tylose before rolling out my fondant. This is optional, but it makes the fondant easier to handle. For the body, I used a circular cutter (2 1/2 inch circle). 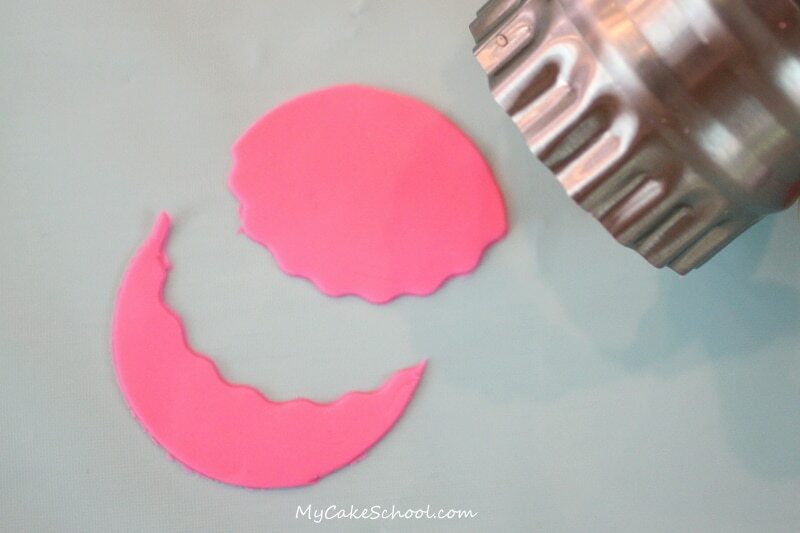 I needed something closer to an oval for the main part of the body, so I used the same cutter to cut away some excess fondant from our circle. 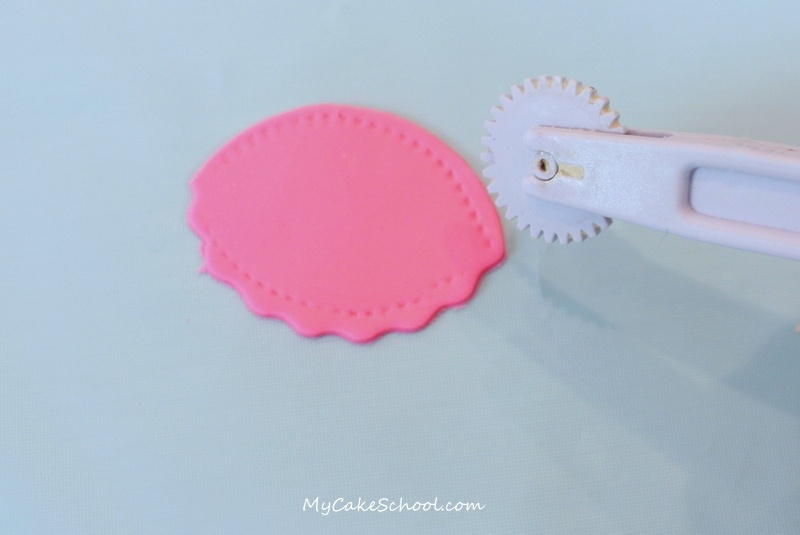 Since my cutter has a scalloped side, I used that….but don’t worry if you don’t have a scalloped edge. Smooth would be just as cute! I repeated this process for the wing….only, I cut an even more narrow oval. For an extra little detail, I added “stitching” using Wilton’s stitching/embossing wheel. 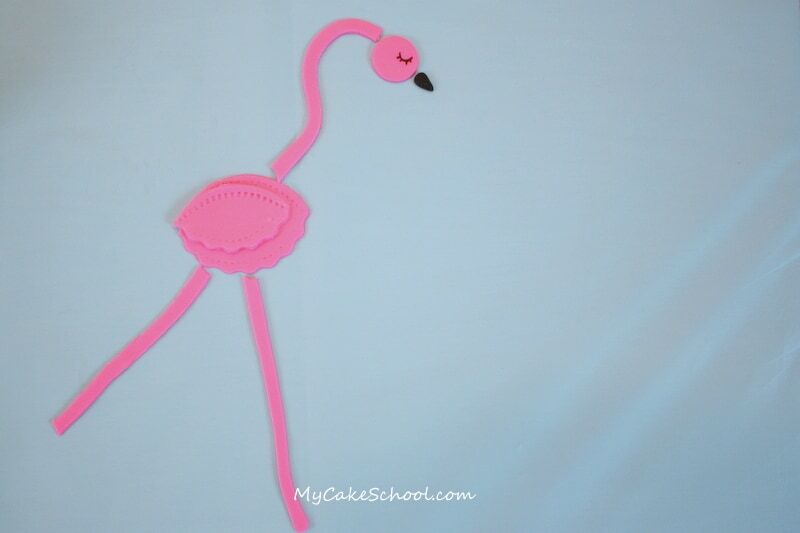 The legs and neck were strips of fondant that I cut with my knife (freehand). I drew on the eye with an Americolor black food coloring pen, and the beak is a little piece of black fondant. Here is the basic idea…. it was just a matter of placing them on the frosted cake. (I applied my pieces while still soft…but you could dry in advance if you’d rather.) *Make sure to read my update in green written below re: the legs ;0)! Since I never miss an opportunity to add some ruffles, I decided to make some for the waist and swimsuit straps! 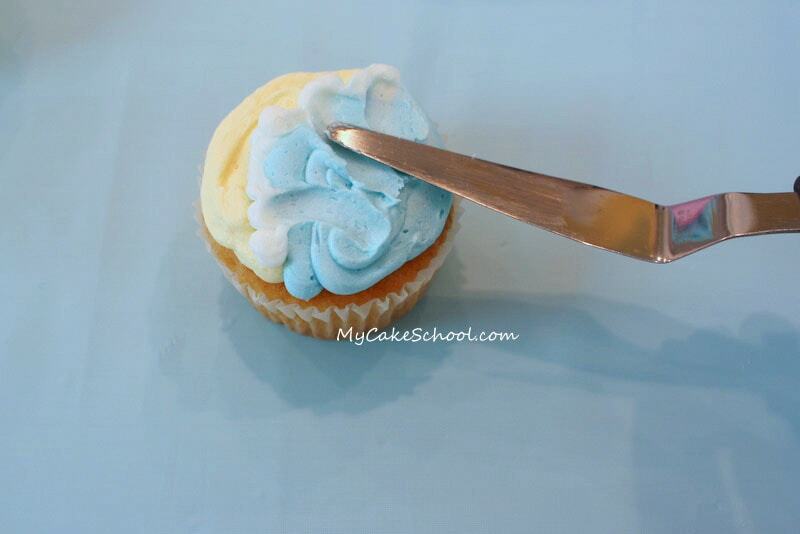 ;0) — This is fondant tinted Americolor Sky Blue with a little tylose kneaded in. I rolled it out and cut out strips that measured 1 1/4″ wide for the ruffles around the waist, and strips approx 3/4″ wide for the ruffles at the straps. 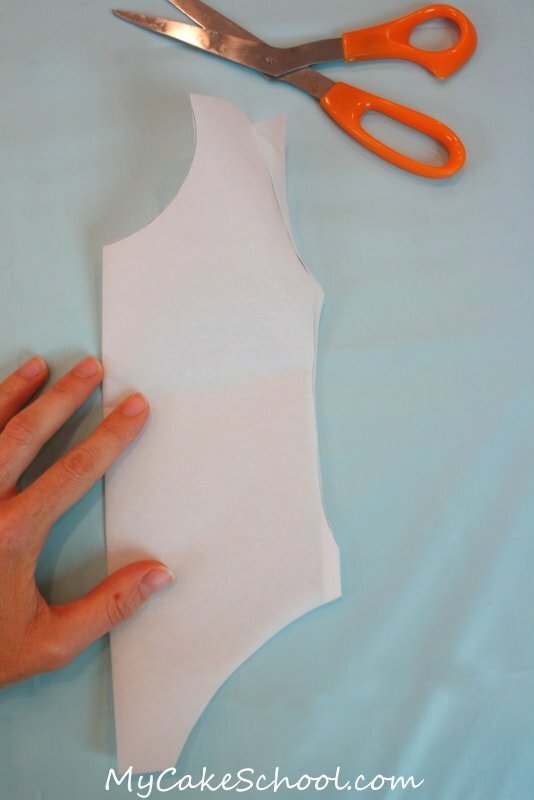 Making the ruffles is very simple. 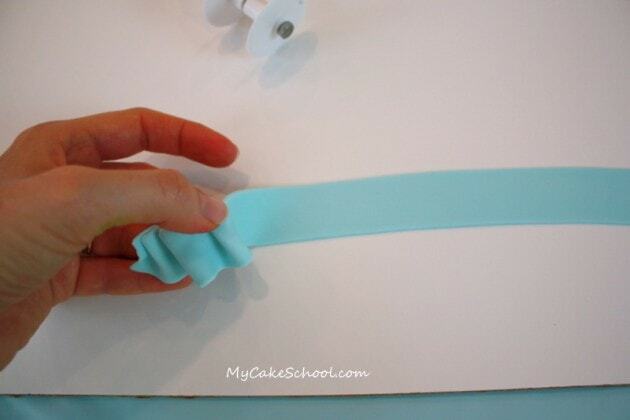 Just make tiny folds as you work your way across the length of your fondant ribbon. With each fold, I gave it a little pinch along the top so that it would stay in place. The length of the ribbon did not matter so much, since the ruffles are forgiving and you cannot tell where one “ribbon” stops and the next starts. Here I am adding the ruffled ribbon! You’ll want to do your lower row of ruffles first and then overlap with the top row. Cuteness! *** Update: My Sweet Flamingo below is bending his leg the wrong way! I didn’t realize that flamingo knees bend backwards rather than forwards until I read through the comments below! So, you can make yours the right way ;0) Thanks for the head’s up! After adding the smaller ruffles to the straps (same process as the waist), I used some pink fondant bands to accent/outline parts of the swimsuit for a little added personality. I debated stepping away from the cake at this point…but just couldn’t help myself from adding polka dots. I added tiny white dots of buttercream all over the suit with a Wilton tip 2. :0) Not necessary, but I like it! That’s it! I think that the swimsuit turned out really sweet and would be perfect for a beach or pool party. If you have a ballerina party in mind, you can still use our basic design and add a larger ruffled fondant or buttercream tutu around the waist! 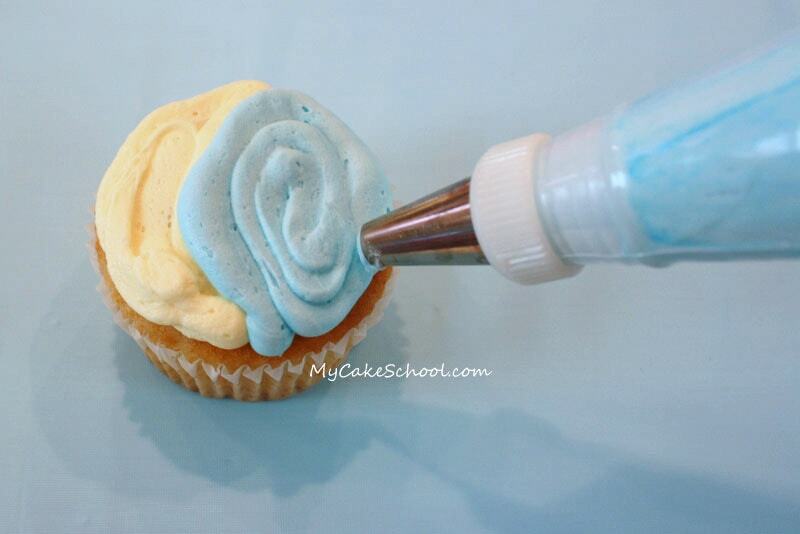 I started by using my Wilton Tip 12 (medium round tip) to pipe part of my cupcake with “sand” (Americolor Egg Yellow) and the other half with water (Americolor Sky Blue). Pipe on the sand first, so that the water can slightly overlap. Next, I piped on white “puffs” with a Wilton Tip 2. Any of the small round tips (2, 3, 4) would work great…but I already had my tip 2 bag filled from the polka dots I made earlier! 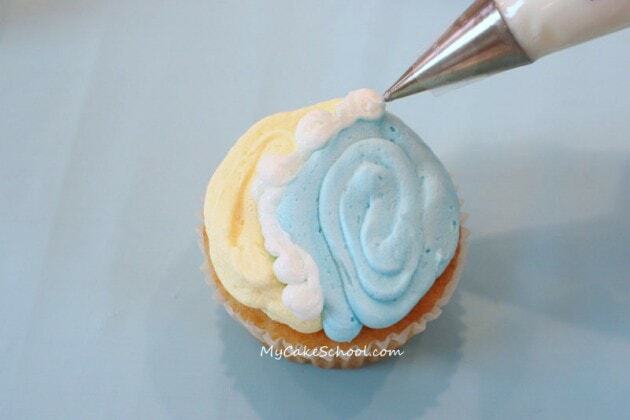 To finish off the look, I took a spatula and spread part of each white “puff” back into a swirly wave. This gives you a little color variation and makes the waves look a little more realistic. 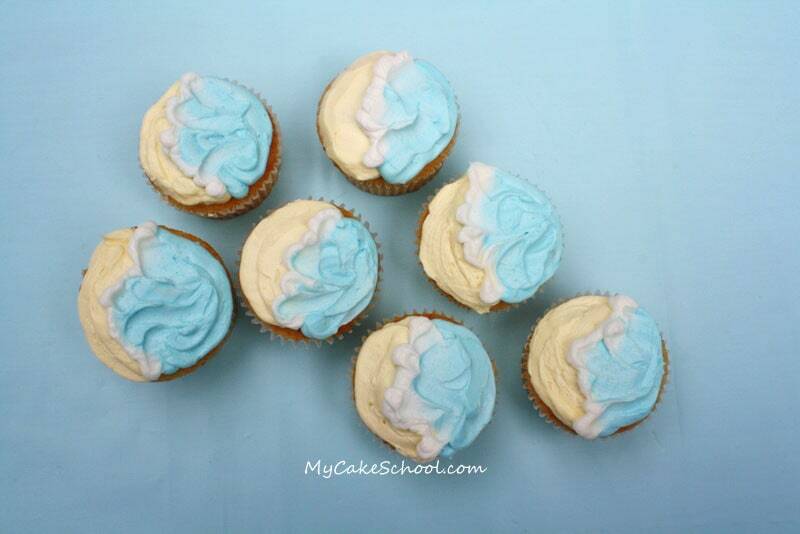 Here are my ocean cupcakes. I kept them really simple, since I didn’t want to take away from the swimsuit cake that they’ll be placed around. But, there are lots of different ways to personalize these and make them your own! Cocktail umbrellas would be really sweet on the sand side. This is so cute. I wish I had a little girl to make one for! Love Love Love! Can’t wait to try the ruffle too! Very nice, what kind of cake you used for this, it looks so good and moist, I am new at this and Im so glad I subscribed, I am learning so much, thank you. How darling and looks so easy. Can’t wait to try it. Love the ruffle too. Thanks for sharing your talent. This basic design would also work very well as a gymnastics leotard, either for an Olympics-themed celebration or a young gymnast’s birthday party. Very cute! So cute! The ruffles are just ADORABLE! Wow, this is just an amazing cake! Thanks for the great instructions. thank you!!! 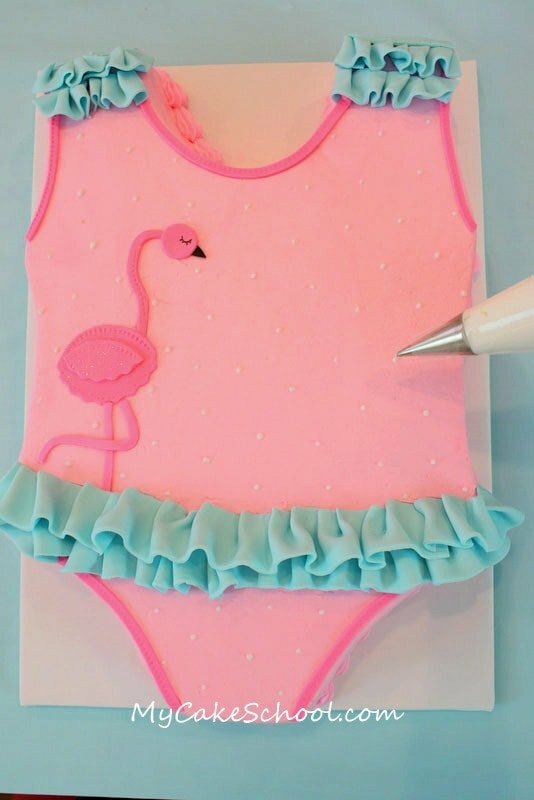 this is absolutely adorable…next summer this will surely be a cake I will make for my grand-daughters!